Federal authorities also contend that the doctor sent a text message expressing concern that Borderline Bar and Grill mass killer David Ian Long had prescription drugs in his possession that he had prescribed for someone else. A doctor who owns an urgent care facility in Irvine was arrested Tuesday on charges of illegally distributing opioids, including to a man charged with running over and killing an off-duty Costa Mesa fire captain riding his bicycle in Mission Viejo. Dzung Ahn Pham, 57, of Tustin, who owns Irvine Village Urgent Care at 15435 Jeffrey Road, was arrested on two counts of illegally distributing oxycodone, according to Thom Mrozek of the U.S. Attorney's Office. 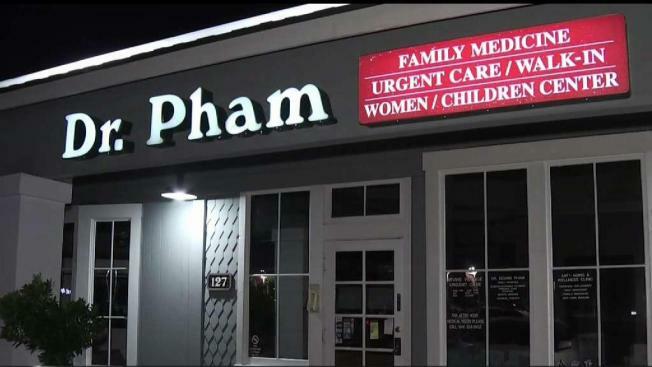 Federal authorities said five people who received drug prescriptions from Pham have died of overdoses. Federal authorities also contend that Pham sent a text message expressing concern that Borderline Bar and Grill mass killer David Ian Long had prescription drugs in his possession that Pham had prescribed for someone else. Pham is accused of writing prescriptions to people without examining them, and he allegedly sold prescriptions to drug addicts or to dealers selling the narcotics on the black market, Mrozek said. Prosecutors allege Pham wrote "an extremely high amount'' of prescriptions over three years, so much so that a CVS pharmacy in Irvine stopped taking prescriptions from Pham more than five years ago. Over the summer, Drug Enforcement Administration agents conducted two undercover operations targeting Pham in which he allegedly steered the agents two a pharmacy in Irvine that filled many of his prescriptions, Mrozek said. Five people who obtained drugs from Pham from 2014 through last year overdosed and died, prosecutors said. Stephen Taylor Scarpa, 25, of Mission Viejo, who is charged with second-degree murder in the death of 44-year-old Costa Mesa fire Capt. Mike Kreza, was allegedly high on drugs from Pham at the time of the deadly collision on Nov. 3, Mrozek said. Prescription bottles with Pham's name on them were found in Scarpa's van after the collision, according to a DEA affidavit. Pham charged between $100 and $150 per office visit, Mrozek said. The doctor deposited over $5 million, mostly in cash, into his and his wife's bank accounts between 2013 and September of this year, according to the DEA affidavit. He also deposited about $1.7 million into a business bank account that investigators suspect came from insurance payments, Mrozek said.